Police respond to a crash caused by a tractor driven through downtown Denver. 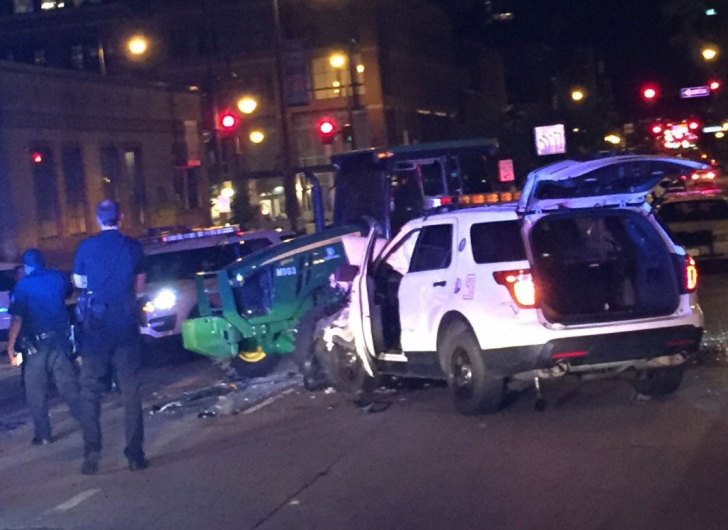 DENVER — A man driving a tractor led authorities on a pursuit through Denver on Friday night before colliding with a police vehicle at 15th and Market streets. Video on social media showed more than a dozen squad cars giving chase, with multiple civilian vehicles hit, forcing authorities to shut down the intersection of 15th and Blake streets. The driver reportedly suffered multiple dog bites while resisting arrest, and eventually was taken into custody by police. Emergency responders were called to the scene to treat the suspect and officers injured during the pursuit. Addie Hooper, 20, visiting from Amarillo, Texas, with her mother and sister and a family friend, was eating at a window seat at a restaurant and facing Market Street. Suddenly she saw a tractor speeding down the road. Then she saw a Denver police SUV, traveling the wrong way down Market, crash head-on with the tractor. “We were just like, ‘Whoa, that’s crazy!’” Hooper said. For more on the story, visit The Denver Post. A pair of Panther opponents dealt a tricky couple games to Moffat County High School baseball players while the Bulldogs were on the road.